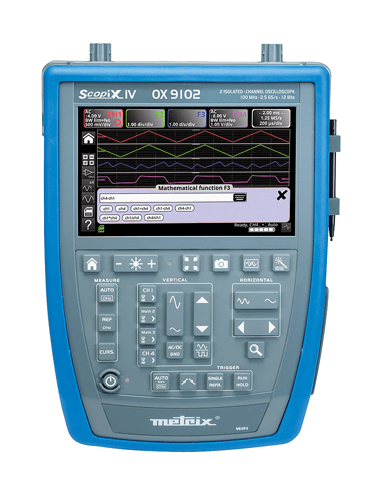 The OX 9304 is a portable, stand-alone, “tablet-icon generation” SCOPIX IV oscilloscope with 4 totally-isolated 600 V channels with a 300 MHz bandwidth. It also offers a memory depth of 100 kpoints per channel, considerably increasing the available duration for recording. With its backlit 7″ WVGA TFT colour touch screen on a black background for easier reading, menus available in more than 13 languages and the design of the keyboard and casing, the SCOPIX IV is particularly comfortable to use. Equipped with unprecedented functions, like all the SCOPIX IV range, the 4-channel / 300 MHz OX 9304 digital oscilloscope is a compact “multi-instrument” offering genuine high performance thanks to its 12-bit converter with a vertical resolution of 0.025%. 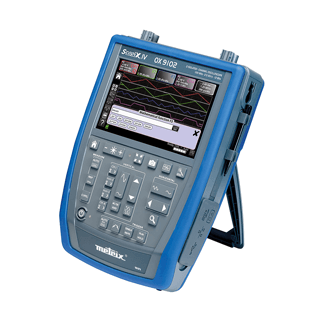 This oscilloscope benefits from standard and advanced “MATH” functions allowing users to define a mathematical function for each of the traces, along with vertical scaling and definition of the actual physical unit.